Looking for something special to give? Create something one of a kind with Blurb! People love getting really creative, one-of-a-kind books for Christmas. Books that elicit a “where did you find this?” response. As the leading indie- and self-publishing platform, Blurb has an entire online bookstore full of unique books by an incredible array of undiscovered, self-published authors, artists, and photographers. 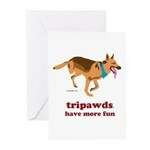 Featuring the stories of 25 inspawrational canine amputees loving life on three legs, Tripawd Heroes is the perfect gift for your vet, oncologist or anyone with a three legged dog. 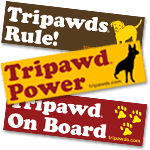 This 128 page magazine style guidebook features photos, hand-written notes, and blog entries from the first 32 members who hosted the Tripawds traveling KillBarney Tour, from Caira Sue in January, 2010 to Rizzo in June, 2012. 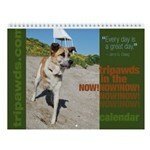 This pocket planner book features inspirational photos of three legged cats and dogs loving life on three legs, selected from the Tripawds Calendars! The elegant design includes full color photos with blank month-at-a-glance grids and weekly two-page spreads for keeping track of all your to-dos. Without any specific dates, you can create your own custom weekly planner any time of year! A children’s book By Leah Bradshaw Howell with poems and photos describing the beach adventures of three legged dog Wally. Written and illustrated by students at the Wingra School, a small, independent day school providing a progressive education for children ages 5-14. For each book sold, $5 goes to the Joyce Perkins Scholarship Fund. or See Current Blurb Promotions Here!